One of the most exciting cinematic rediscoveries of the last few years is now available to anyone with a Netflix streaming account, thanks to the splintered nature of modern film distribution. I'm referring to the unearthing of Ted Kotcheff's 1971 film Wake in Fright, an Australian-American coproduction that is surely among the bleakest films I've ever seen. And I've seen Salò, Grave of the Fireflies and Nil by Mouth. The story of Wake in Fright is very simple. At the end of the school year, John Grant, a teacher at a one-room schoolhouse in the Australian outback, leaves the remote town in which he's stationed and does his best to get back to Sydney. He gets waylaid, though, in the even more remote (and fictional) town of Bundanyabba, where he soon falls into alcohol- and violence-fueled dissolution. He loses all sense of propriety, all his morals and all hope of ever getting home. I won't reveal the ending (though it's more than 40 years old, this still somewhat obscure film has been reintroduced into circulation only within the last two years). But suffice it to say that even Grant's last-ditch attempt to escape his own personal hell is unsuccessful. The story of Wake in Fright's rediscovery and rerelease is far more complex. Made with a small budget for United Artists, the film was released (in some locations under the title Outback) to generally favorable reviews. Even some critics prone to moralizing viewed the film positively, despite its harrowing depictions of violence and vicious alcoholism. Wake in Fright achieved little success in the U.S., UK and Australia, but it was greeted more warmly in France. It vanished quickly from most theaters. This is just one of those films that fell through the cracks. In the 1980s and '90s, it received limited release on video, and screened only occasionally on Australian television. Extant prints, of which there were never many, existed only in various states of deterioration, and the original negatives were apparently lost. Somehow or other, that negative was discovered in a vault in Pittsburgh and saved from destruction in 2002. It turned out to be in bad shape, too, but a better negative was surprisingly located a couple years later. 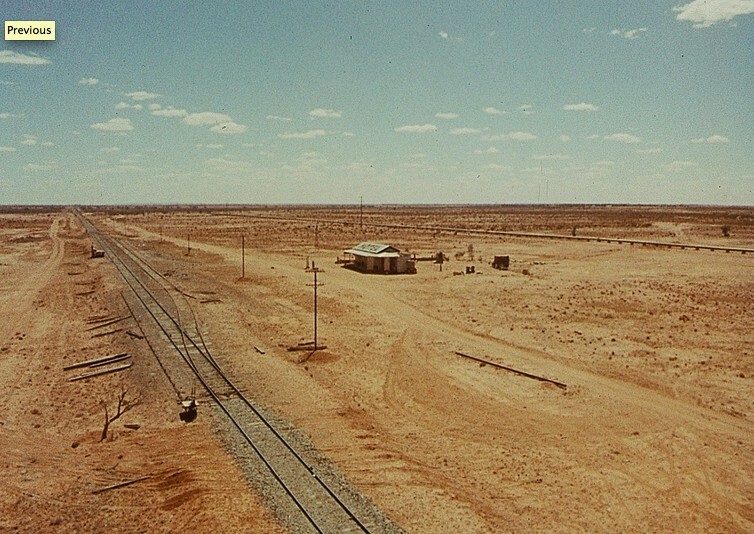 Restoration of Wake in Fright, which had since acquired a favorable reputation as a "lost" cult film, commenced at the National Film and Sound Archive of Australia later that year. A full 4K digital restoration was finally completed in 2009, and the film has screened at many major international festivals. (It's apparently one of only two films to screen more than once at the Cannes Film Festival.) 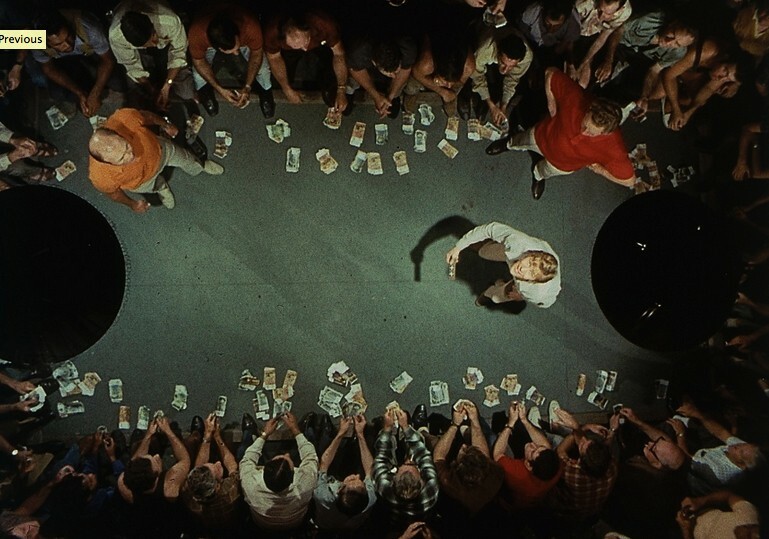 I don't know when Netflix added it to its streaming catalog, but the fact that Wake in Fright has gone from nearly lost to potentially in anyone's living room is astonishing. When Grant gets stuck in "the Yabba," he has no choice but to swill massive quantities of beer and commence an association with the local drunken thugs. 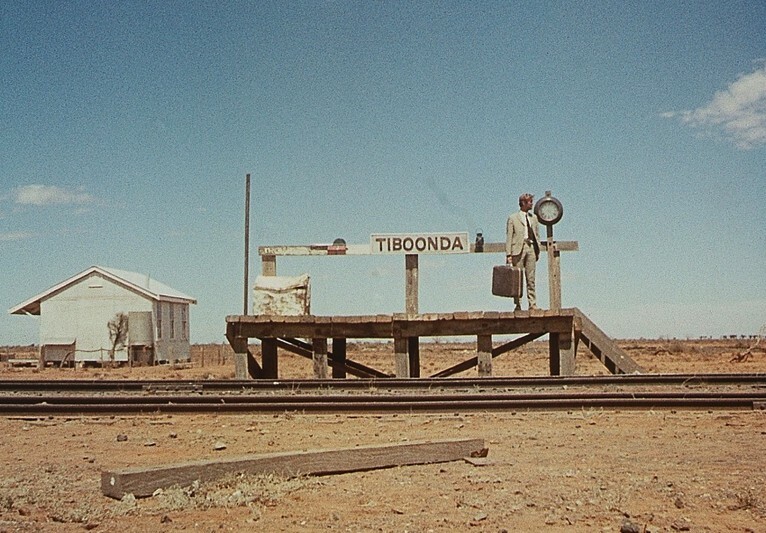 A viewer expecting anything other than bleakness, though, should heed the warning that director Kotcheff provides in the film's very first shot, a 360-degree pan of "downtown" Tiboonda. The absolute void at the heart of the film's story is presented symbolically right there at the start. 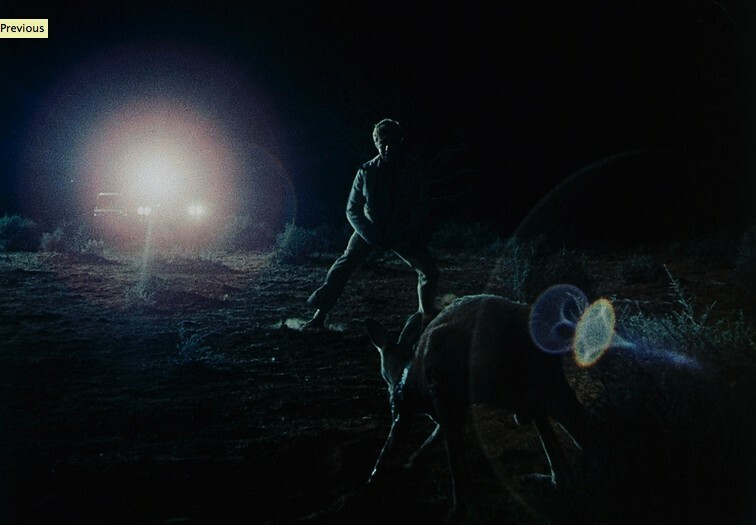 At the time of its original release, as well as during the period of its rediscovery, Wake in Fright's most controversial scene is that in which the main characters drink heavily, drive into the outback and shoot a bunch of kangaroos. Even though they take a few ’roo chunks back to the Yabba for grilling, this is no hunting trip; it's a massacre. The carnage — and here the film uses actual footage of a kangaroo hunt that was allegedly supervised by genuine hunters — is sickening, and apparently caused many a walk-out in theaters where the film has been shown. For its vicious violence, and for its symbolic function as the film's heart of darkness, the kangaroo hunt reminded me strongly of the rabbit hunt in Jean Renoir's 1939 The Rules of the Game. Both scenes serve the same function: showing the moral and spiritual bankruptcy of their respective film's societies. Ted Kotcheff is a journeyman director whose career stretches back into 1950s television; his better-known films include North Dallas Forty, First Blood, Uncommon Valor .... and Weekend at Bernie's. Based on such a résumé, I wouldn't have expected much from Wake in Fright. But Kotcheff is on his game for the whole film, which is extremely well shot, edited and art directed. 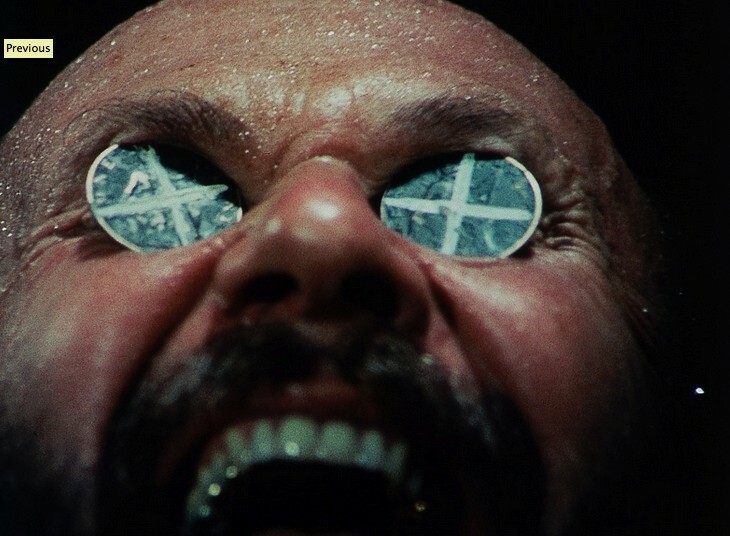 Though I haven't seen many of his films, I'd be surprised if Wake in Fright weren't the best of the lot. Bleak and harrowing, it's not for all tastes, but the daring moviegoer will find many rewards in it. Heads or tails? You lose, either way. Wake in Fright is not showing in any theaters in the area.